Al Habtoor Motors launches a multi faceted Mitsubishi showroom complex in Al Ain! To meet the growing demand of Mitsubishi customers in Al Ain, Al Habtoor Motors has launched its latest state-of-the-art Mitsubishi showroom and After-sales complex. The launch of the new facility coincides with Al Habtoor Motors’ vision to expand its presence in the United Arab Emirates, especially in the Emirate of Abu Dhabi. Recently, Al Habtoor Motors commissioned the world’s largest Mitsubishi showroom spanning a built up area of 235,000-square-foot in Mussafah, Abu Dhabi. With addition of the new 121,169-square-foot facility in the industrial hub of Al Ain, Al Habtoor Motors plans to cover all bases in the Abu Dhabi market. 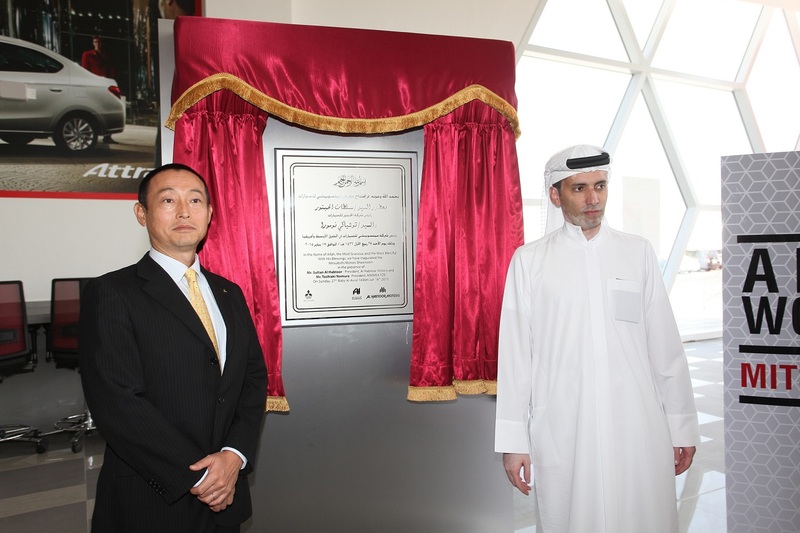 The new Mitsubishi complex was launched in the presence of Mr. Ahmed Al Habtoor, CEO of Al Habtoor Motors, , Senior management of Al Habtoor Motors and Mr. Toshiaki Nomura, President – MMMEA FZE. The new multi-storied showroom complex features a basement, ground floor and mezzanine. While the basement features covered parking area for hundred cars, the ground floor features Mitsubishi passenger vehicles showroom, an After-sales area featuring spare parts center and separate service facilities for passenger and commercial vehicles. The showroom reflects Mitsubishi’s winning spirit and features large display areas for the entire range of Mitsubishi vehicles. The showroom design focuses on sporty elegance and customer convenience. Al Habtoor Motors has constantly strived to offer its clients some for the finest automobiles backed by efficient After-sales service, which is why, the Mitsubishi showroom also features a separate service and parts section under one roof. “We have a very special relationship with the people of the UAE. Al Habtoor Motors and Mitsubishi continue to share a unique and decades long partnership of trust and success. We are both driven by professionalism, quality and high standards of customer service. We love challenges and we keep challenging our own achievements. This has helped us to reach new frontiers as we continue to expand our network.” added Mr. Ahmed Al Habtoor, CEO of Al Habtoor Motors. “A great product cannot be one, if it fails to satisfy the customer. In the case of automobiles, unfailing After-sales support becomes as critical as the sales efforts itself. This is where our association with Al Habtoor Motors has helped us ensure that all Mitsubishi customers in the UAE enjoy a great ownership experience. We at Mitsubishi Motors Corporation (MMC) are proud of Al Habtoor Motors achievements as they continue to expand their network thus enabling Mitsubishi to maintain its leading position in the UAE market as well as the region.”, said Mr. Toshiaki Nomura, President – MMMEA FZE.